In 1989 Bruno Buchberger moved with the RISC Institute from the main campus of JKU to Hagenberg. The medieval Castle of Hagenberg, which had just been renovated by the Upper Austrian government, was now the new home of RISC. Now it is 2012, RISC has been growing continuously, so that space in the castle had been exhausted: RISC must expand! 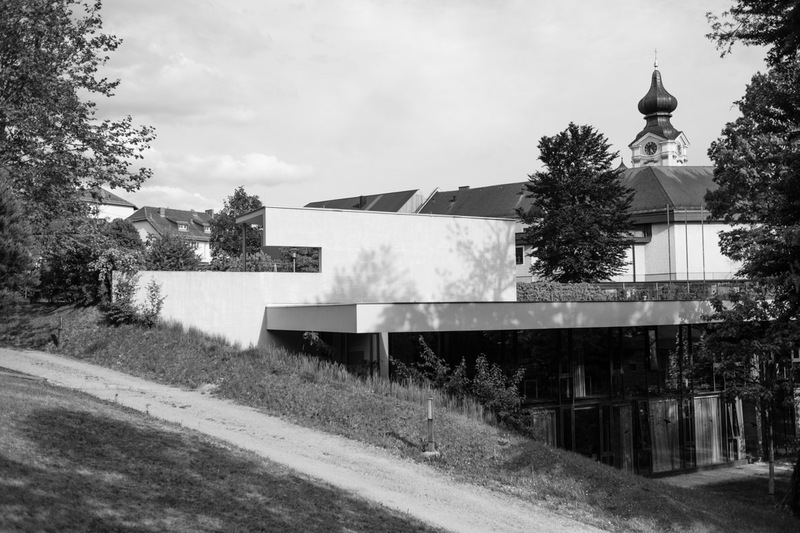 Planned by the renowned architects Riepl&Riepl Architekten from Linz, who have also conducted the award-winning renovation of the castle 25 years earlier, the RISC expansion building is located to the north of the castle just next to the existing pond. It is a two-story building to the east of the pond leaning towards the slope along the parking area with its main entrance from the north. The flat roof of the building does not reach higher than the current street level, so from the parking lot the building expands downwards. Towards the park and the pond the building is equipped with a glass facade. The upper floor hosts a seminar room, project offices and social areas, the lower floor consists mainly of smaller office units and a visitors office. An extra entrance from the south gives easy access to the building when connecting to or from the castle.